Ultimately it is the paint in different colours which express and defines the building. Hence, people choose high quality and expensive paint for their house so that house looks attractive, for a long time. However, after spending money on paints, people are not satisfied with it. Various problems appear on the surface like hair cracks, dampness, discoloured patches, etc. Wall putty will take care of most of the above problems or defects. It will fill minor cracks and surface imperfections. Applying putty on wall before the paint application helps you to achieve smooth, levelled, finished and stunning surfaces for all types of paint. Wall putty is very important prior to paint application. It is the foundation of painting. There are basically two types of putty are available in the market i.e. acrylic putty and cement-based putty. Acrylic wall putty is a water-based wall putty which fills holes on masonry surface and patches surface finishing. It is made by using an ideal combination of white pigments, extenders, acrylic emulsion medium and additives. Acrylic wall putty is mostly used on interior surfaces and not for exterior surfaces. You can use it on suitably primed interior masonry, plastered walls, asbestos, concrete, etc. surfaces. Acrylic putty is ready to use. You can directly apply it on the wall without adding or mixing any kind of materials. Acrylic putty provides a very strong, durable foundation and brings out the best performance. It has a special acrylic binder that keep strong grip on the wall surface and ultimately increases the paint life. This type of putty gives a rich and smooth finish when applied on masonry walls to fill substrate imperfections prior to giving better and higher coverage of paint. It has a unique design and butter like consistency which makes application easy, excellent fitting, levelling and sanding properties. 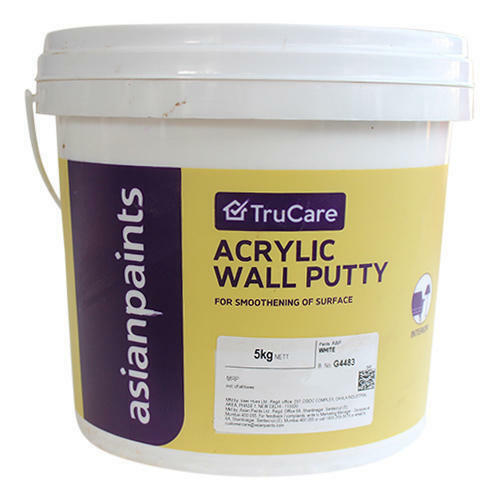 Acrylic wall putty is suitable for overcoating with any kind of water or solvent based paint which gives a polished and impressive wall surface. You can apply on almost all interior surfaces whether it is new or old. It has better alkali resistance. Acrylic putty dries fast therefore ensures faster completion of a paint job. Acrylic wall putty has a smooth and matt finish. It is available in white shade. The drying time of acrylic putty is around 4 to 6 hours. The coverage of acrylic putty depends on the porosity and texture of the surface. The covering capacity of acrylic wall putty is around is 25 to 30 sq. ft/kg/coat. i.e. 2.5 to 3.0 sqmt/kg/coat or 24 to 35 sqft/Kg/2 Coats i.e. 4 to 3.5 sqmt Kg/2 coats. Acrylic wall putty is available in 1 kg, 5 Kg, 10 kg, 20 kg, 35 kg packs in a plastic container. Always store the container in well ambient conditions, ventilated location and away from the source of ignition and fire. Use safety kit like rubber or polythene gloves/glasses and face mask. Wear suitable nose pad during surface preparation and sanding to avoid dust inhalation. In case of contact with eyes, immediately wash the eyes with water and take medical advice. Always apply putty using a putty knife/spatula/trowel. Also Read: How to Apply Wall Putty Before Paint? Stir the putty well before application of it. Keep it away from the children as it may harmful to them. New plaster should be allowed to cure for a minimum of 12 weeks. The container must be tightly closed when not in use to prevent drying. Keep it in a dry and cool place. Do not pour leftover paint down the drains or in water courses. It has a low binding property than the cement-based wall putty. Acrylic putty cannot be applied on the exterior surface. It is costly as compared to white cement wall putty. The price of the acrylic putty may vary with manufacturer or brand. It is more expensive as compared to white cement wall putty. Acrylic putty will beautify the walls and create a strong foundation for paint application. Hence, when you spend big money on high-quality paints, do not compromise on low-quality putty! Also Read: All You Need to Know About White Cement Wall Putty. Previous PostPrevious Currency Ban to Hit Indian Real Estate Market!